James saying there’s a skinny Liz and a heavier set liz. Points out one of them talks to her the other doesn’t. James – We’re going to have to plant the information. Jason – one of them wears more clothes one of them wears more Bikinis .. Fills her in that he thinks Liz has a twin one heavy the other skinny. Tells her to be on the look out. Meg asks if he’s talked to James because she’s always staring at her. Jason – Not heavier.. just thicker.. I swear if there is twins in the house it’s her I’m positive.. the minute you start to look at them there is a big difference. Jason says the one out there right now is Skinny liz the one last night was heavy liz. Jason – Skinny Liz doesn’t speak a word with me. Meg had a long conversation with Liz last night she’ll ask Skinny Liz about it. Jason says he was crazy when thinking johnnyMac had a twin but he’s not crazy with this. Jason really started noticing by the weight difference between the two. 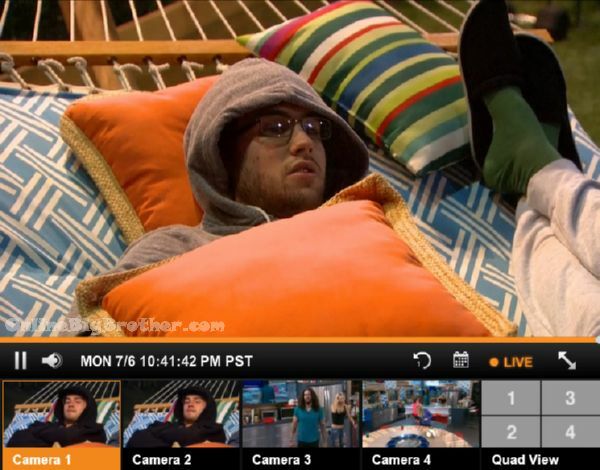 Jason says they have to get Liz out otherwise they are dealing with strong pair that will never put each other up. Meg says she’s a bit worried about the vote now with the twist. Jason doesn’t think the twist will make any difference. Jason says he would love for her and Da to stay but it’s not going to happen. 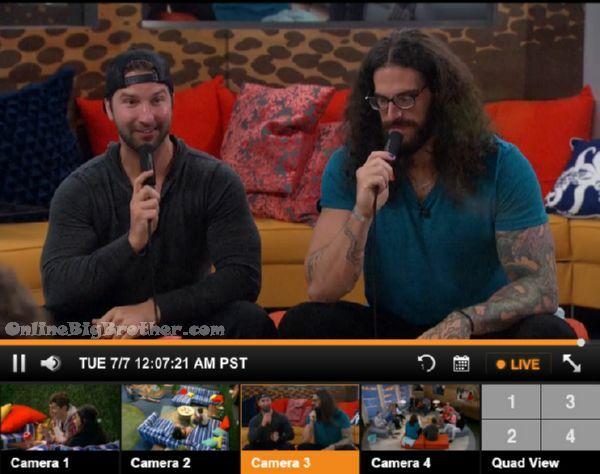 Jason – I will be very very very surprised if Day stays over you.. I’m still going to vote for Day. Da tells Meg she knows Meg is staying but she can’t go home to her daughter without at least asking people for their votes. Meg understands. Jason – Shelli ruined the Kathy Griffin twist. they all agree the twist won’t make a difference. Not a whole lot going on..
Clay says Mef shouldn’t go home. He asks if Steve is voting out Da’vonne. Steve promised Shelli his vote and that is who she wants him to vote for. They agree Audrey has lied to a lot of people. 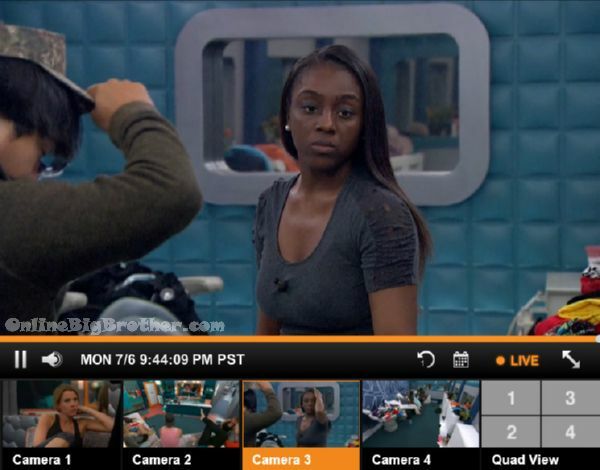 They agree there will be less “Petty Drama” and more ‘Game Drama” once Da and Audrey are evicted. Steve brings up liking Jace in the beginning but then having to distance himself for game reasons. He’s doing the same thing with Audrey now. Steve says his Note has 3Gigs of ram and the iphone 6 only had 1 gig.. They agree the house will want to break up Clay and Shelli. 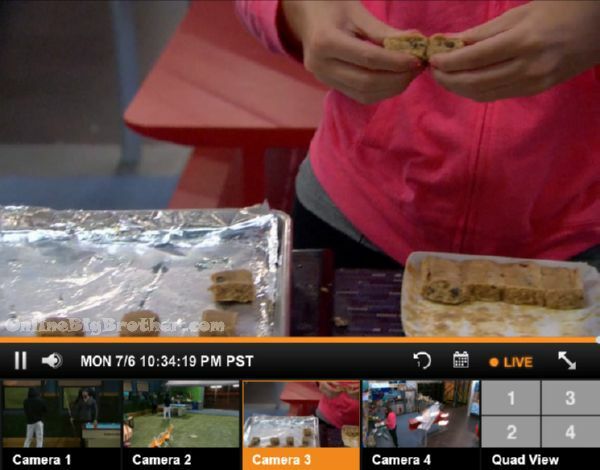 Jeff warns her that Meg won’t make it to the end because everyone knows if she makes it to the end she’ll win. 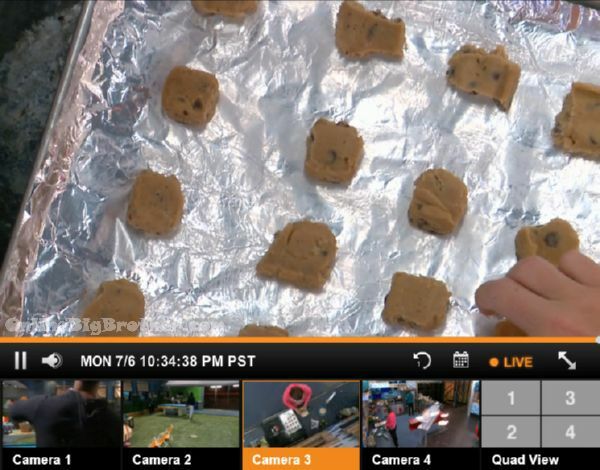 Jeff doesn’t know about Clay anymore. 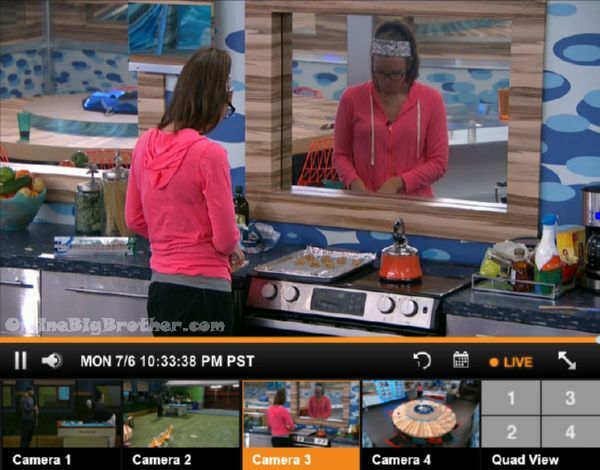 Jackie says Liz is coordinated but she’s not sure how smart she is. Jeff brings up that Liz only cares about getting to Jury so that is what they are going to give her. Jeff wants to bring JohnnyMac to the end. Jeff and Jackie both don’t like Steve. Jeff says Steve has no backbone. Jeff likes Jason says he brings a wealth of BB knowledge to their group. 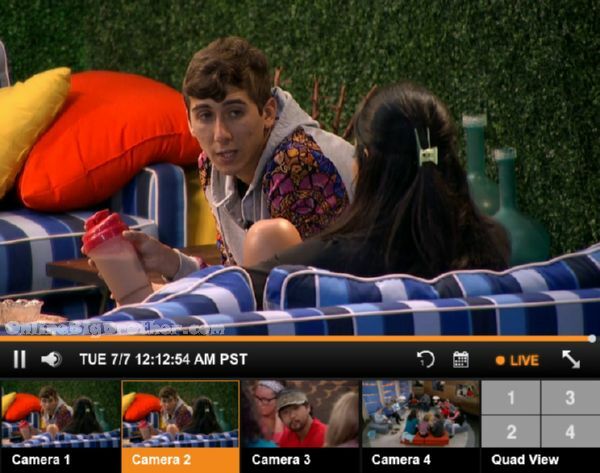 Jeff says Vanessa is on to them that they are closer than they making apparent. Jeff thinks he’ll continue the ruse that he’s working with Vanessa. Jeff fells the house is making him out to be a bigger target he really is. Steve says he lives so close to Canada that it’s not uncommon for the local stores to accept Canadian Currency. Midnight Waiting around for the Podcast to start (They’re going to do a mock podcast tonight) .. Clay asking everyone if they have shot a gun before. Jason says even if Da has the power to nullify 3 votes she still doesn’t have enough votes to stay. 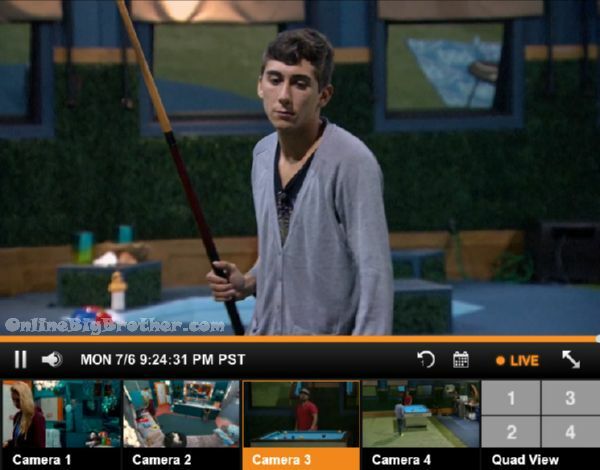 Jason says he overheard JohnnyMac and Steve talking game at the pool table. Jackie says Jeff was telling him how “F*****g annoying” Steve was when he wouldn’t talk game to him. They head inside to listen to the podcast.